I have been playing around with flow quilting these past few days. I have previously called this type of quilting 'graffiti quilting', but have since switched to using the term 'flow quilting' because 'graffiti quilting' was coined by Karlee Porter, who has a very distinctive style completely unlike my own. Cristina Cameli calls it 'wild quilting' and I think Angela Walters calls it 'improv quilting', so there's really no set name for it. I like flow quilting, though, because it feels like the designs just flow together. Whatever you call it, quilting like this is fun! I'm quilting the mini quilt I made with the denim epp flowers I made for one of my Denim Days posts and my machine doesn't really like quilting close to the denim. I'm guessing it's because the denim is raised off the background fabric so much and the presser foot is half-on the denim and half-off it when I'm close to it. I started out by outlining the middle flower and then flow quilted my way over to the one on the left. I quilted around that one and then tried doing pebbles around it, but that's when my machine started making funny noises and breaking the thread. So, after debating what to do for a while, I ripped out everything close to the flowers so that I can echo quilt around them. You can see where I ripped out stitches between the two flowers in this picture. Echoing around the flowers gives me a little space so that my presser foot isn't on top of the denim as I'm flow quilting and that seems to be working much better. 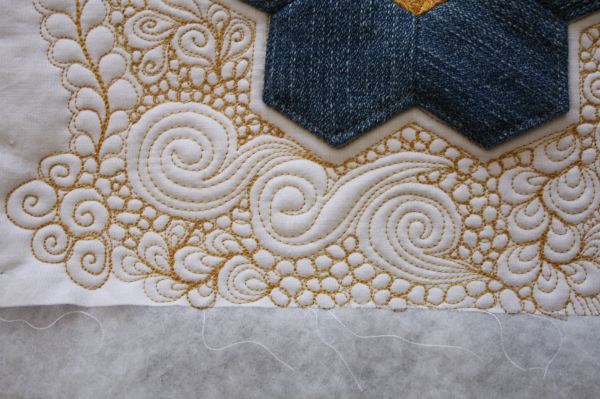 As a bonus, I really like that edge of white between the flower and the flow quilting! Last night I added some back-and-forth lines in one section and I really like how that makes the motifs seem to float above the background. I'll be using more of those. I also really like these long swirls. They're quite a bit bigger than everything else I've quilted so far, so I want to scatter them around to make the quilting look balanced. We're on our Easter break this week, so there's no school and no babysitting for me. I'm hoping to have a lot of time for quilting before regular routine starts up again on Monday. I'll be linking up with Let's Bee Social and NTT this week. I really like your gold thread againt the white background and the blue denim. Leanne, this is going to be beautiful. 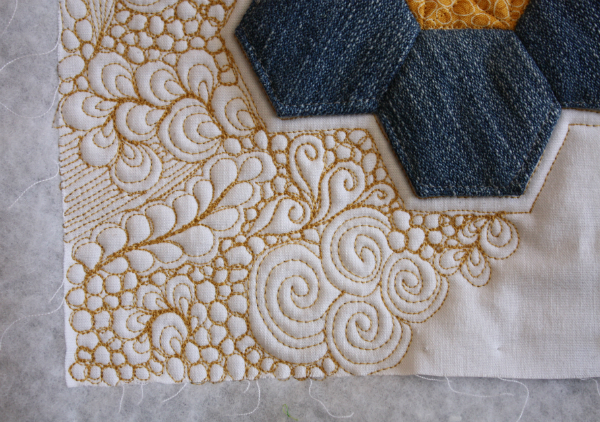 I love the gold thread for the background quilting. It compliments the denim very well. I could look at flow quilting all day. It adds such great texture and gives the eyes so much to see. Can't wait to see it finished. Oh wow! The quilting is amazing! I get so inspired when I see quilting like this! Just gorgeous! Looks very pretty and draws me in! 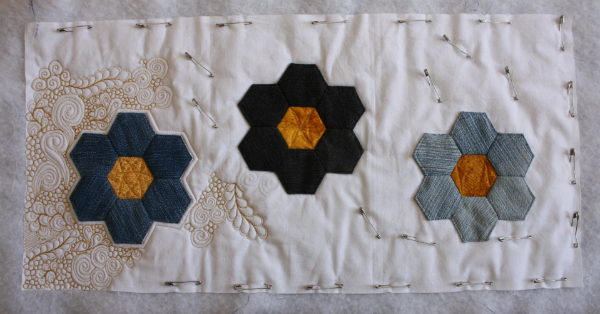 I love the echoed flowers with the flow quilting. Beautiful! I am enjoying following your progress with this new to you technique, Leanne. And I love your choice of name for it. It is incredible how much the quilting adds to this piece. What a beautiful choice of threads! Beautiful, and the gold thread works so well with the flower centres. Lovely free motion quilting. It's also inspired by the zentangle mouvement. It's so much fun to play with. Amazing quilting! Can't wait to see it progress. Your flow quilting is exquisite! I'm away from my Janome, but when we reunite, I'm going to give this a try! I've been practicing and I think I'm ready. Back and forth lines are HIGHLY underrated yes? I have also recently found they really make a design pop. Love the thread you're using (what is it? ), and the echo is also really a good way to 'pop' those hexies. I've done a little of the 'graffiti' style quilting too, and it is fun, but stresses me a bit too. The glitzy (to my eye) looking thread against the denim is amazing. I agree with Sandra--the echo quilting really makes those flowers stand out. It's a great way to "contain" the flow quilting. That's looking great. The contrasting thread color makes the free-motion stand out nicely. 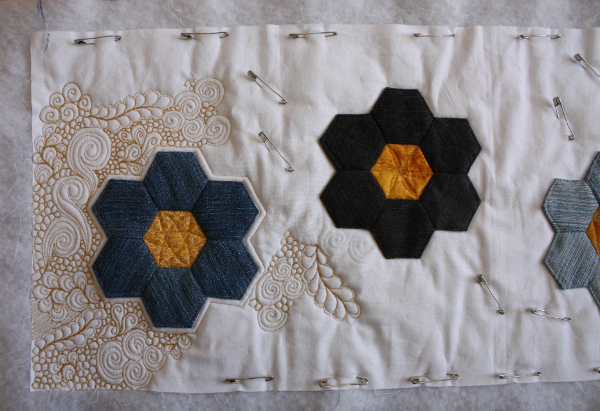 I also like the white space between the flowers and the quilting. Yes, your back and forth part gives dimensions to the motifs next to them. Amazing! Your quilting is very inspiring. I googled the term after reading a later blog of yours and it brought me here. LOL.